GERMANY - Exports of fresh and frozen pork from Germany grew slightly in the first six months of the year, up four per cent to 886,000 tonnes. This increase was predominantly driven by the booming Chinese trade, which more than doubled to 148,000 tonnes during the period. Germany remains the largest exporter of pork to China, accounting for one fifth of all shipments during the period January – June 2016. However, its share of the market has fallen from 26 per cent in the same period a year earlier, as other major producing nations all increased the volume of pork they exported to China. Decreases in shipment volumes were recorded to other EU member states, with only Austria bucking this trend. Italy was still the largest export market for German pork, but volumes were down 6 per cent to 169,000 tonnes, only 21,000 tonnes more than Chinese shipments. 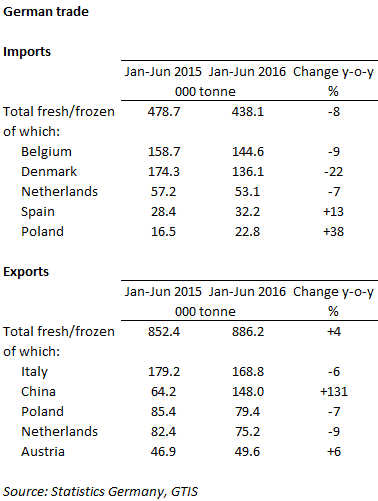 German imports of fresh/frozen pork recorded a decrease of 8 per cent during January – June 2016 versus the same period a year earlier.